May 25 – For the second year running London will host the FIFA eWorld Cup Grand Final 2018. The finals organised by FIFA video gamemaker Electronic Arts will be played from August 2-4, though the venue is still to be announced. 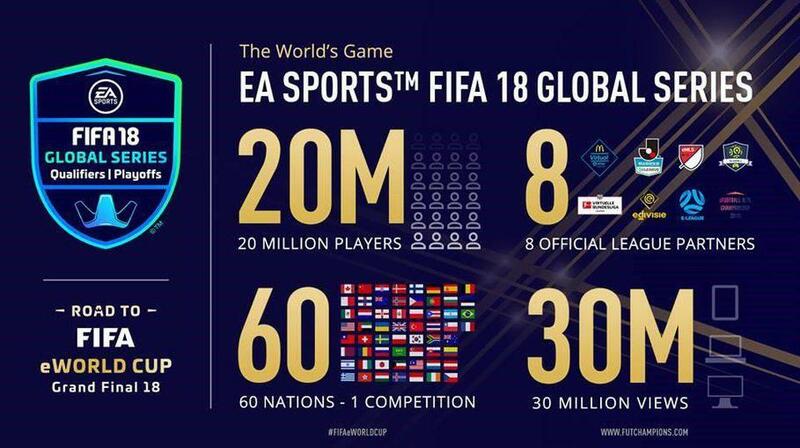 To date more than 20 million have competed in the EA SPORTS FIFA 18 Global Series, seeking to qualify for one of 32 final places. In 2017 the winner walked away with a $200,000 cash prize. To get to the finals 128 players on both Xbox and PlayStation platforms will compete in the Global Series playoffs in Amsterdam, May 28-30 and June 1-3. The top 16 players on each console from the playoffs will qualify. The playoffs will be streamed live on the EA Sports FIFA Twitch channel. The Global Series this year has increased its number of tournament partnerships with top-tier leagues, clubs, brands and esport organisations, including The Hyundai A-League, eDivise, MLS, J-League, La Liga, eLigue 1, Russia Premier League and Bundesliga.